You see an egg, I see a crouton. I gave up thinking about what the perfect thing would be to top this risotto. A risotto, saffron or otherwise, doesn’t need to be topped at all. I wasn’t looking for something that would add a lot of flavour, especially considering the fact that I didn’t want anything that would compete with the saffron, so I thought about chopped and seared king mushrooms, which I still think would be a fine idea. But I settled on small croutons, tossed in more saffron butter, or better yet, paprika butter to give them a little more colour. I would toss them in the butter that I made to stir though this risotto (the tiniest of spins on finishing a risotto with butter). And then? Then I finished the risotto and flat out forgot to make the croutons. It’s not like I could make them once the risotto was done–few things are as unforgiving as risotto that has been sitting around for a minute past its prime. So I enjoyed the risotto as-is that night and put the leftovers in the fridge. To stretch out the meek remains for breakfast for two, I planned to top the risotto with eggs and the idea you see here was born: I fried the eggs in the butter and paprika mixture intended for the croutons, and let the edges of the egg crisp up for a little contrast in texture. And that’s how I’ll make this forever more. 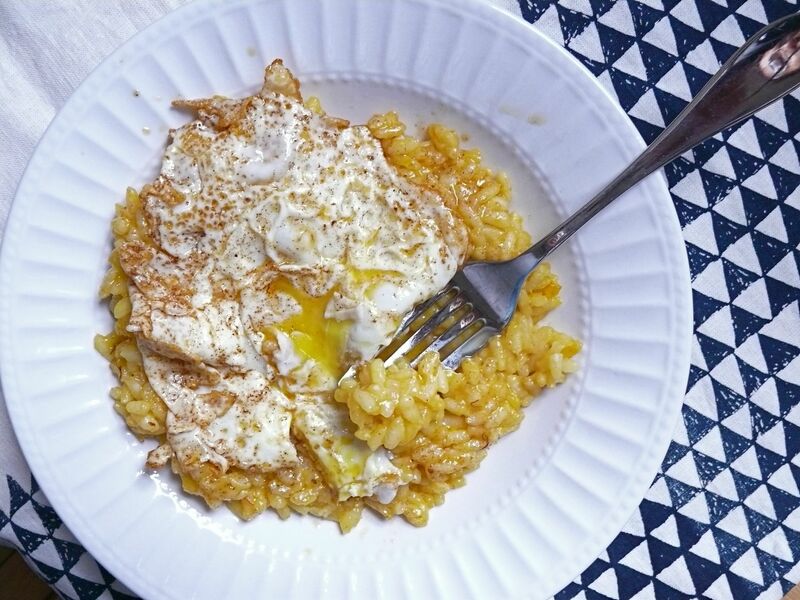 The egg yolk makes the risotto just a little richer and creamier–as its other traditional finishing ingredients, butter and cheese, are intended to do. 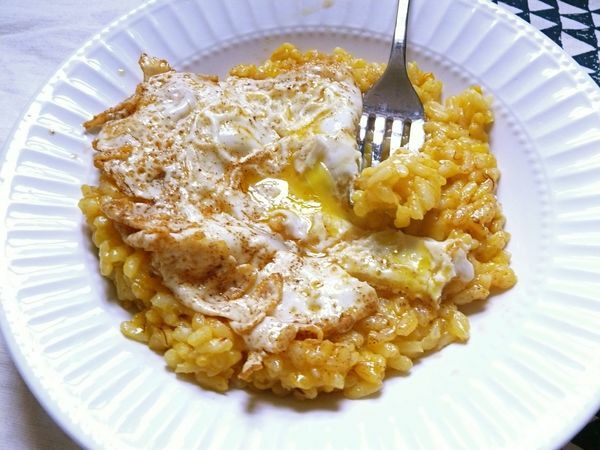 I used smoked paprika for my eggs and it complimented the risotto without overpowering the saffron. Tastier and more luxurious than a crouton by far, as you can imagine. But why imagine when you have a recipe? Bring broth (or water) to a gentle simmer, in a pot over medium heat. Reduce heat and keep at a low simmer, covered. In a large and wide, heavy-bottomed pot, melt 2 tbs of butter over medium heat. Add 1/2 tsp of saffron and the shallots. Sweat the shallots by cooking them gently, stirring, until softened and starting to become translucent. Add the rice and stir well to coat each kernel in the melted butter. Cook, stirring frequently, to toast the rice, which will take about 3 minutes. Add the wine and cook, stirring, until the it has evaporated. Add 2 ladles of simmering broth, just under a cup, and stir well (if using water or low-sodium broth, add about 1/2-1 tsp of salt as needed at this time too). The rice should be gently simmering in the broth. If the simmer is strong, lower the heat slightly (you don’t want the broth to boil off before it cooks the rice.) Stir the rice gently, making sure the rice doesn’t stick to the bottom, especially as the broth reduces. Once almost all of the broth has been absorbed, add the same amount of broth to again and repeat. After the third addition of broth, the rice will be almost cooked. Taste to check for seasoning and doneness–keep in mind that you’ll be adding Parmesan which is salty but if you need a little more salt, add some. By the end, you want the grains to be cooked but still have some bite in the centre. 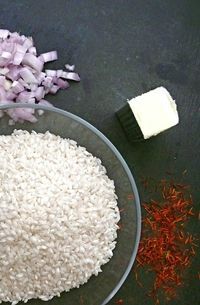 The risotto should be creamy and thick enough for your spoon to leave a trail through it, but loose enough for the rice to spill and slide into that trail in a second or two. When you’re almost there, heat a large, non-stick frying pan over medium heat. 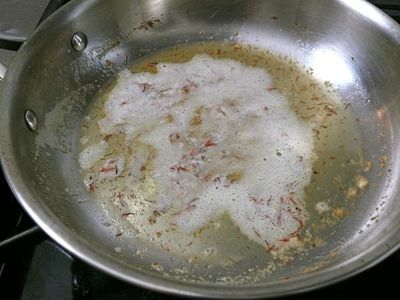 Melt 2 tbs of butter and then add the remaining 1/2 tsp saffron. Let the saffron toast and release its colour and flavour, cooking for another minute. Pour the saffron butter into a bowl and return the pan to the heat. Add the remaining tbs of oil butter and the oil to the pan, add paprika and heat to fry your eggs–if frying eggs in batches, divide these ingredients too (into two should be fine). Fry eggs as desired (sunny side up or over easy) to just under desired doneness. Turn heat off but leave eggs in pan. 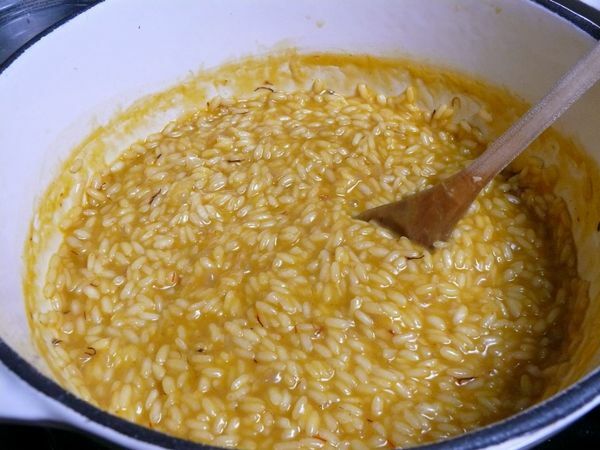 Finish risotto by adding the saffron butter and stirring through. Turn off heat and add the grated Parmesan to the risotto and stir through. Spoon risotto into individual bowls, top with fried egg and serve immediately.